The Samsung Galaxy Camera comes with Samsung's S Planner calendar. It has several different types of view: year, month, week, day along with list (agenda) and tasks lists. Adding a new event is quick and easy, and you can also set an alarm to act as a reminder. There is also a calculator aboard. It is nicely touch optimized with big, easy to hit buttons and some advanced functions. The Samsung Galaxy Camera features a decent alarm clock application which allows a huge number of alarms to be set, each with its own start and repeat time, ringtone and note. The Clock app also comes with a stopwatch, timer and a world clock. The Desk clock mode displays the time along with weather info and a calendar. 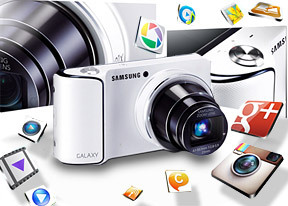 The Samsung Galaxy Camera comes with a built-in A-GPS receiver that is used to geo-tag photos, but also gives you access to the full Google Maps functionality. Maps have several view modes and two-finger tilt and rotate are enabled. A long press on the map will bring up more info about that area, including a local search for anything you can think of (cafes, restaurants, ATMs, etc.). Street view is also a part of the Google Maps package. Vector maps are quite data-efficient and you can save even more traffic by caching areas of the map for offline use. You can't download an entire country, but you can cache all of London, for example, in just 30MB. If Navigation is available in your country, you can use that along with offline rerouting (but not offline route planning). The Google Play Store is what sets the Samsung Galaxy Camera apart from other digicams. Emails, web browsers and the rest of the features are cool, but with the Play Store you can extend the functionality much further. That means new camera apps, new image editors, new ways to sync your images, you're not stuck with what the manufacturer chose to install at the factory. The interface features several scrollable tabs - categories, featured, top paid, top free, top grossing, top new paid, top new free and trending. Apps usually have several screenshots (some even offer a demo video) so you can get an idea of what the app looks like before installing it. The Google Play Store is full of all sorts of apps - everything from camera apps, music / video players, to file managers and various tools, you'll always see something worth a try. It's not just apps though - depending on your country, the Store will also offer music, movies, magazines and books.